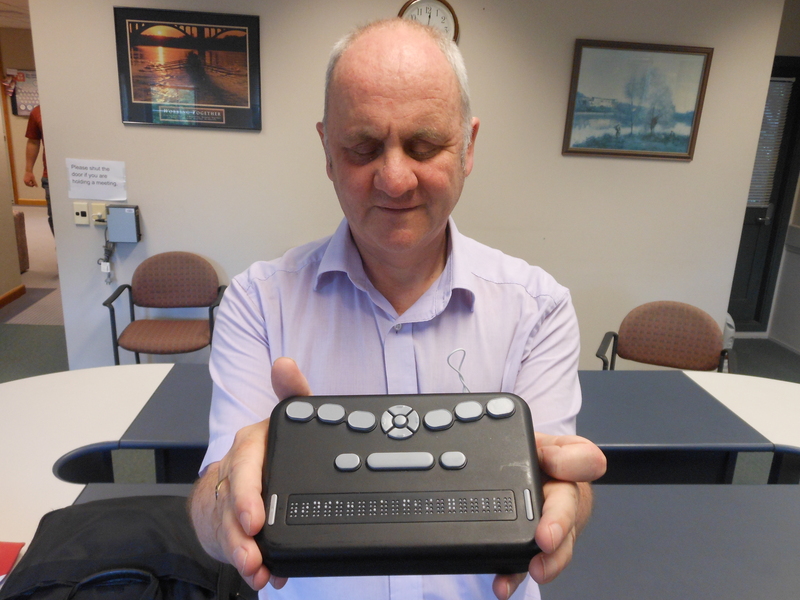 The Blind Foundation has helped develop a new affordable braille reader for people living with sight loss around the world. The Orbit braille reader was launched last week at the Annual International Technology and Persons with Disabilities Conference in San Diego, California. It is the first refreshable braille reader which is both affordable and portable. A refreshable braille display is a device that allows a person who is blind or has low vision to read the contents of a display, like a computer, one text line at a time as a line of braille characters. Until now, braille displays have cost from around $3,000 upwards, putting them out of reach for many people around the world. In contrast, the new Orbit braille reader will retail for less than US$500 (NZ$742), providing an important new option for people who are blind or have low vision to access literacy at an affordable cost. The Blind Foundation was one of 10 organisations worldwide involved in creating the new technology, along with the Royal National Institute for the Blind in England, National Federation of the Blind in the United States, American Printing House for the Blind, Canadian National Institute for the Blind, Perkins, the Norwegian Association of the Blind and Partially Sighted, Association Valentin HauY, Sightsavers, and Vision Australia. The Blind Foundation provided research and development funding, expertise and testing. In addition to the Blind Foundation contributing financially, Executive Director of Strategic Relations and Accessibility Neil Jarvis was on the board of managing members of the company set up by the agencies to create the display. Neil says the display, which takes flash cards and has USB and Bluetooth capabilities, will give people greater access to computers, mobile devices and is great for reading electronic books. “Rather than carry a book in seven or eight volumes, which is not uncommon for a novel in braille, you might be able to carry around thousands of books on a single flash card,” says Mr Jarvis. The Blind Foundation will be the exclusive supplier of the Orbit braille reader in New Zealand, which will be available later in the year.